Once the concrete has been placed, the decorative aggregate is ready to be revealed. There are several exposure methods contractors can choose from, depending on the look desired and size of the project. Only the top of the stone is exposed while the rest remains permanently embedded in the concrete. 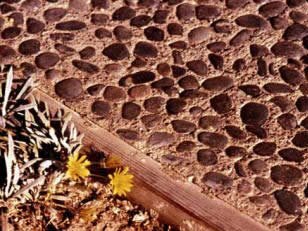 The general rule of thumb is to remove the surface mortar to a depth no more than one-third the diameter of the aggregate particle. Brushing and washingThis is the oldest method and the simplest because it doesn't require chemical retarders or special tools. You just wash away the thin layer of surface mortar covering the aggregate by spraying with water and scrubbing with a broom until the aggregate is exposed to the desired depth. The timing of the operation is critical, however, so this method is often better suited for small jobs. The work should begin as soon as the surface mortar can be removed without overexposing or dislodging the aggregate. You can test this by lightly brushing away the surface mortar in a small area with a stiff nylon-bristle broom. Using a surface retarderToday, most contractors expose aggregate by spraying a chemical surface retarder onto the slab surface immediately after placing and finishing. This delays the set and gives them the flexibility to remove the cement paste up to a day or so later, either by scrubbing or pressure washing. This flexibility can be especially important on large jobs or during hot weather. One top-surface retarder product is Surface Deactivator by Brickform, which provides ten exposure depths, from a simulated light acid etch or sand blast finish up to full exposure of 1 ½” aggregate. Surface Deactivator offers an extended window before the surface paste is removed, allowing the concrete to harden properly, which locks in the aggregate and decreases pop-outs. Another retarder specifically for producing decorative exposed-aggregate finishes is Expo-Rock from Fritz-Pak. Packaged dry in 1-pound water-soluble bags, the concentrated retarder is easily mixed with water in the field for application by low-pressure sprayer. It will permit removal of the surface mortar within 8 to 24 hours after initial concrete set. For vertical surfaces, you can also find chemical retarders that are thick enough to be painted on, such as Formula F from Euclid Chemical. 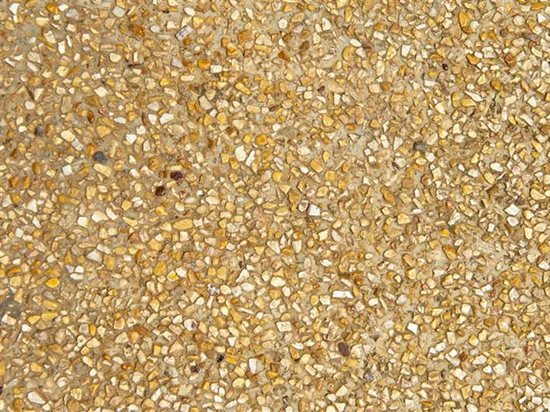 Abrasive blastingIt's also possible to expose the aggregate after the concrete has set and hardened by using abrasive blasting (either sandblasting or shotblasting). The disadvantage of abrasive blasting is that it can fracture the aggregate and dull its appearance. This method is not a good option if preserving the shape and full color intensity of the aggregate is essential.